NatureWord – Page 820 – Trustworthy health information resource. What is the function of vitamin B6? Vitamin B6 or pyridoxine widely supports the activity of the nervous system and helps prevent the accumulation of homocysteine in the blood, thus significantly lowering the risk of developing coronary heart disease. Moreover, vitamin B6 ensures the proper distribution of sugar and starch and actively participates in the production of amino acids. In addition to this, vitamin B6 reduces stress, is involved in the production of red blood cells, helps strengthen the immune system and supports the activity of the digestive system. Last but not least, vitamin B6 is the prerequisite for a healthy nervous system and plays an essential part in the growth and reproduction of cells. 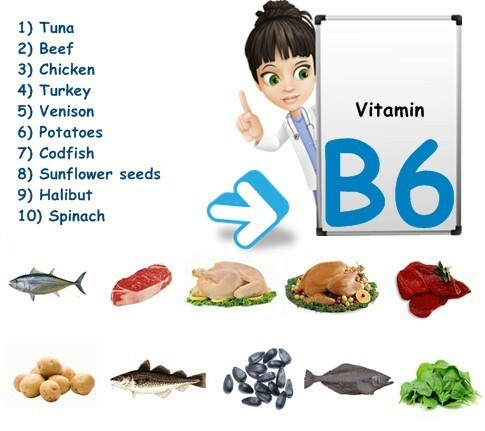 Vitamin B6 deficiency symptoms: fatigue and malaise (a general feeling of being unwell), anemia, extrasystoles (known as palpitations or skipped heart beat), skin problems such as eczema or seborrheic dermatitis, even convulsions and seizures, the latter being a sign of severe vitamin B6 deficiency.